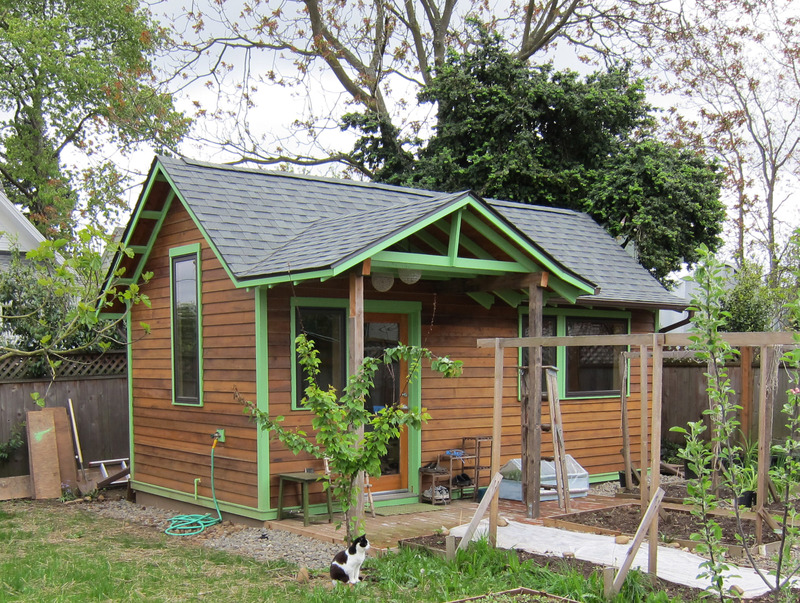 Up for rent in Portland, February 2015: a tiny purple structure in someone’s backyard, apparently a converted garden shed. At 165 square feet, it had the same area of 5 sheets of plywood laying side by side. The price was normally $1200/month, said the ad, but could be reduced to $950 for renters interested in helping organize in the main house. Screencap from the craigslist ad, posted on Facebook by Karl Lind. 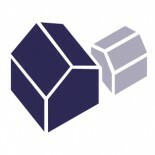 c) a sign of grassroots creativity in housing? Don’t answer that right away, because the Portland housing market is absolutely crazed right now. Anyone who tries to rent, buy, or sell here finds themselves in a surreal world where the formerly inconceivable is now, well, the norm. And in my opinion, the path back to sanity goes right by that purple shed. With a few twists, such dwellings are a solution for urban density that’s radical and reasonable at the same time. That purple shed ad is not unique. Other recent craigslist ads have offered garden structures as residences. The competition for rentals has become so frustrating and ridiculous it’s inspired a whole new genre of literature, the satirical housing ad. For example, as featured on Curbed, one ad offers a place with “Industrial feel with open floorplan,” while it pictures photo of a sidewalk with gray fence and box. Satires like these have become common on forums like craigslist, reddit Portland, and facebook. They’re wonderful relief from the real stress and pain of gentrification and densification. Photo posted by facebook user Danny O’Connor. Real estate isn’t just a financial topic in Portland, it’s an emotional one. There’s a sense of betrayal among the kind of creative, idealistic people who helped make Portland desirable. Rising rents are pushing many further to the fringes. Portland is getting richer and whiter, according to a city report – does that mean some of its creative blood is leaving too? On reddit and Facebook, there is talk of moving to Detroit, Chicago, or even, god forbid, Eugene. In San Francisco, home to even more extreme housing prices, someone posted this clever lament for the old days. Photo posted to facebook by Erika Knutson. Perhaps Portland will have its own milk-carton victim soon — how about a prize winning barista on a tall bike? Those looking to buy receive their own humiliations. Reports indicate that when bidding on a house, it is no longer enough to simply bid far above the asking price. To beat out cash-laden investors, you must include a heartfelt letter/selfie combo demonstrating why you are most deserving. Portland Monthly created a mad lib to help you get started. Real estate Mad Lib! It’s just like being a kid again. There’s a palpable sense of despair in “Den$ity,” among those trying to slow the juggernaut of densification and gentrification. But from another perspective, this is what success looks like. Decades ago Oregon and Portland made strategic long-term decisions in the interest of environmental conservation and quality of life, such as the creation of urban growth boundaries to prevent sprawl and save rural land, a commitment to transit, and (one of my favorites 🙂 ) public ownership of the Oregon Coast. And now it appears to have worked: Portland is a great place to live, and everyone wants to move here. There is simply a lot of demand for housing and a limited supply. A city report projects that between 2005 and 2035, the number of households in Portland will grow by more than 100,000. Those people have to live somewhere. Because the growth boundaries constrain development geographically, new housing supply in Portland often comes from “going up,” as in multistory apartment blocks, or “filling in,” as in vacant lots. Projects like this one, replacing a one-story house with a 3-story apartment building, kinda do both. Photo borrowed from Portland Chronicle. This is basically the plan. The city is supposed to get denser, especially near transit. No one in “Den$ity” seems to say it’s possible or desirable to stop densification. But its citizens seem desperate for a way to steer Portland’s growth in a gentler direction — in particular, away from looming examples of “going up,” like this one. “There [has] to be a happy medium,” says a Richmond neighborhood resident in the film. As luck would have it, my friend “Kylie” was looking for a place to live when the purple shed ad came out. It was a good location, and for better or worse the price of $950 was competitive. Kylie had been looking at a room in a shared house, which was going for $700, but would require her to share a kitchen and bath. In contrast the purple shed had its own four walls, shower stall and kitchenette. Kylie couldn’t work out a deal with the purple shed’s landlady, because there wasn’t enough room for Kylie’s kids to sleep on their weekend visits. No big surprise there. But then, something remarkable occurred. The landlady tried to help Kylie. I can hardly imagine a corporate or government landlord going to such lengths. But it doesn’t surprise me, when I study some other ads for rented sheds. The “unprofessional” nature of shed development could be one of the best things about it. “I am a 68-year-old gay man,” reads another ad. “The only way I can remain financially independent and stable is to create and rent 2-3 small units on my property.” The owner is offering an interesting deal: if you can convert an outdoor structure on his property into a detached bedroom, you can live in that room rent free as a reimbursement. The effective rent is $400/month, including wifi and utilities. 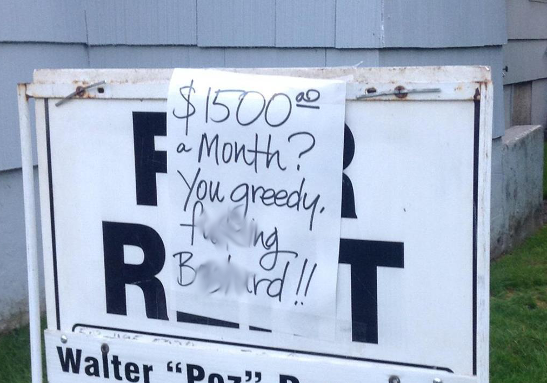 I don’t know any of these “landlords,” but they don’t sound like real estate barons to me. Some of them sound like really grounded and interesting people. And in the context of Portland’s real estate frenzy, their offers look downright reasonable for a creative person. Considering that dogs aren’t allowed at some places renting for >$1000, I’m sure that Cully shed – $350/month, with compatible dog allowed — was snapped up in a flash. We all know what’s wrong with sheds as places for people to live. They weren’t designed as dwellings. Some of them don’t have essential features such as sinks and toilets. Places like these are unlikely to be inspected or permitted. Therefore there are fewer legal protections for tenants. Nonetheless, I see a lot in these shed offerings that’s right, especially in contrast to larger multifamily developments. These homeowners aren’t just fighting perceived outrages by big developers and government, they’re creating an alternative. They are adding to density in a modest way that’s scaled to existing buildings. They are “filling in the cracks” in the most subtle way possible. They are providing a type of dwelling which, in its architectural form of four independent walls and gabled roof, many people associate with personal independence and dignity. 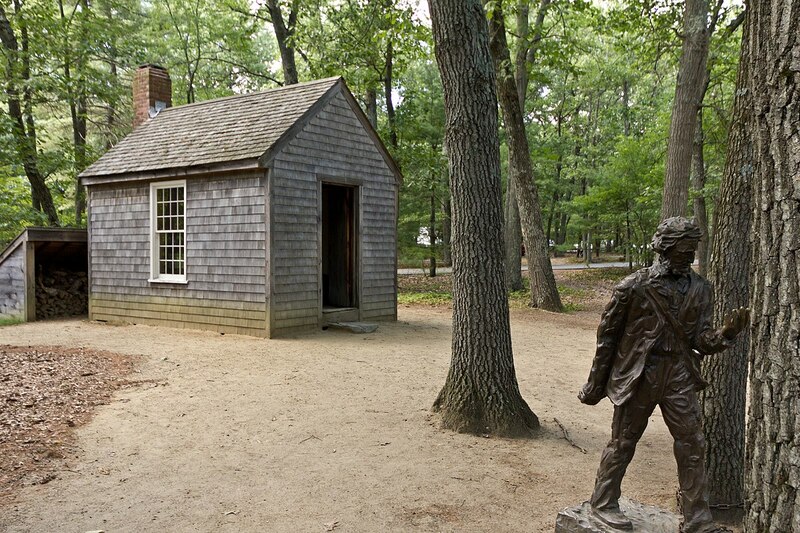 After all, what was Thoreau’s Walden cottage but a shed with a chimney? Finally, it’s clear that some of these landlords are not ruled solely by their monetary interest. They are interested in creating a bit of community. This is an utterly distinct quality from, say, a big landlord with professional property management. The latter might provide good service, but everyone knows there is one ultimate intent: return on investment. Wouldn’t it be great if there was a better version of the backyard shed, let’s call it a “supershed,” one that was inspected, legal, fully habitable, and protected by landlord-tenant law? If so, it could have a huge impact on both the supply and architectural scale of Portland housing. The number of potential sites for supershed housing is tremendous. There are >143,000 single family house properties in Portland, according to a conversation I had with a planning staffer. If only one-third of those properties were suitable for supersheds, that would mean >47,000 building sites. This number dwarfs the number of sites available for apartment blocks, especially if you want to limit demolitions. Supersheds scattered around a neighborhood could house the same number of people as a visually domineering apartment block, while maintaining a low profile architecturally. Supersheds would be well suited to the common one-person household (30% of city households, according to a recent summary of Census data), providing the young, creative and single with housing that could combine economy and dignity. Bigger ones could house 2-person households, which are even more common (36% of city households). Nearly all of these supersheds would be owned by regular homeowners, not corporate landlords. While obviously homeowners vary, some of them would be good people, willing to work out deals and have something richer than a purely contractual relationship with the tenant. In short, they could be the “happy medium” craved by activists. “detached accessory dwelling units,” which are small, completely independent dwellings associated with a regular single-family house. They are often in the backyard or are converted garages. They are also called ADUs, “detached ADUs”, granny cottages, mother-in-law houses, garden cottages, etc. “detached bedrooms,” which are similar to ADUs, but may lack all of the features of an independent dwelling, such as a kitchen. There is real evidence for the benefits of such structures. Aesthetically, ADUs are a type of development that is hard to notice. In Portland and elsewhere, they are required to be substantially smaller than the main dwelling, and compatible in terms of architectural style. Unlike bigger projects, ADUs don’t require demolishing old houses. Economically and socially, ADUs have a fascinating quality. Though many units rent for around market rates, studies in both Portland and the Bay Area show that about 20% of ADUs are occupied for free or at rates far below market. In short, 20% of ADU landlords have chosen to prioritize something other than rent money. You won’t get that from a professional real estate firm. Comments from owners of these properties consistently indicate that the house+ADU/detached bedroom combination is an extremely flexible asset for families dealing with changing compositions and financial circumstances. There remains a significant barrier to their widespread adoption: construction cost. According to Eli Spevak, a co-editor of accessorydwellings.org and a Portland developer behind many innovative projects, the cost of a permitted shed-size dwelling, built to code and hooked up to services, can easily be as much as 20x the cost of a prefab shed of similar size — say, $40,000 instead of $2000. (Of course tricked-out ADUs can cost far more than $40,000, but they are often much larger than shed-size.) Part of the shed-vs-ADU cost differential is features (windows, custom baths, etc), and part is code requirements. In a future post I hope to explore code changes that reduce these expenses — but even at current costs, ADUs look economical compared to commercially built public housing. A groundswell of economical ADUs, detached bedrooms, and (if a legal backyard setting can be made for them) tiny houses on wheels will make it more credible for citizens to object to oversized developments, without being labelled NIMBYs or sticks-in-the-mud. You can see a range of real ADUs on the upcoming tour. This smug and facile article not only misrepresents the above referenced Facebook group I started but does a disservice to the issues of affordable housing, humane architecture, and the tiny house movement itself. Do not assume that because we use humor to express our grievances that we’re not informed and involved citizens actively advocating for a wide range of solutions to Portland’s affordable housing crisis. Many of us are involved in variety of efforts around these issues both online and off. The three “sheds” you reference — the purple shed, the Cully commune, and what was generously referred to as a “rain pavilion” (actually a backyard deck — you provide the walls or roof in exchange for a temporary rent abatement) — were completely illegal, potentially unsafe, and wildly overpriced offerings. All three were flagged and removed from Craigslist. The purple shed was nowhere near “reasonable” as you’ve suggested. At $950 for 165 sq ft. that puts it at $5.75 per sq. ft. The current average for Portland is $1.26 (which is low for the central city but not that low). And for your $950 a month you got the added amenity of a toilet directly across from your kitchen sink. That’s better than the other two which did not include indoor plumbing. Whether motivated by greed or desperation these kinds of rental offerings are illegal and unethical. And it’s no wonder the purple shed lady was nice to your friend — she was bombarded with hate mail (something she shared with your friend and she shared with us) — her email was probably the nicest one in the bunch and gave her a chance to redeem herself. Portland stands to lose a lot as far as diversity and culture if concerted efforts are not made in a hurry. The people who can’t afford to live here anymore aren’t just your “barista on a tall bike”, many of them are the people own and operate the creative small businesses that make Portland so appealing. None of us are expecting to find “a decent flat for the price of a cheeseburger”. What we are expecting is rents that have some relationship to property values and median income, but due to demand and greed rents are outpacing both by about 2-to-1. We also expect our city and state to do something to stem the tide of gentrification and displacement, which despite what you suggest is very much within the realm of possibility. They can start by getting rid of the ban on inclusionary zoning, investing more in affordable housing, cracking down on illegal short-term rentals, and decreasing barriers and restrictions on ADUs, among many other things. Individuals can fight gentrification and displacement by not being greedy a-holes if they are property owners, sharing housing, utilizing land trusts, building ADUs, forming co-ops, and crowd funding to create and/or preserve affordable housing. My parent’s first house was a converted goat shed on a rural property. I lived in a vintage Airstream trailer in the driveway as a teenager when our 4 person family outgrew our 2 bedroom house. I’m a fan of the Mad Housers (Atlanta based homeless housing advocates), Samuel Mockbee’s Rural Studios, and in fact — TINY HOUSES. However, tiny houses are not the only solution to our affordable housing crisis and are not practical solutions for many individuals and families. I know it’s hard to fathom when you’re extrapolating from your own experience as a tiny house evangelist so hard that you can’t imagine individuals with needs different than your own but trust me, they exist. Correction: I should have said wages rather than “median income”. Hi Chloe, thanks for your detailed comments. The idea was to start a conversation about creativity in housing, and perhaps we’ve done that, in a horribly uncomfortable way. My piece was most definitely not a personal attack on you — indeed, no individual is named in a negative way. The mix of humor and anger is not just visible on the facebook group, but in the film I link to, on reddit, and elsewhere. In terms of the subject I find we agree on nearly everything you say in your comment. I agree the problem is gentrification and displacement, and I agree the solution has to include measures to increase fairness and diversity (e.g. inclusionary zoning, land banks) and measures to increase supply (such as buiding ADUs). This piece focused on the supply aspect, in particular the potential of a simpler kind of ADU. But I would love to write about grassroots efforts like co-ops — I simply don’t know enough local examples yet. Anything that demonstrates an alternative to the mode of development we’re currently seeing. What remains as a “difference” in our opinions is the assumptions we make about each other’s characters. I have made a mistake by implying that satirists aren’t involved in other kinds of work on the issue. I apologize for that. Perhaps it’s possible that some of the assumptions you’ve made about me are also misdirected. ? I’d love to continue the discussion about “citizens as developers,” whether the architectural form is sheds or skyscrapers. Can you point to one single assumption I’ve made about you in my reply? All I’ve done is respond to your assertions and misrepresentations. If you do not have a working understanding of the affordable housing crisis, gentrification, and displacement and the various ways they need to be addressed from the policymaking level to grassroots efforts then you should not be positing a solution. You certainly should not be justifying and encouraging illegal backyard shanties like the ones you cited above. And if you’re going to continue to write for public consumption you need to get familiar with digital media ethics and specifically how to responsibly use other people’s content. Hey Chloe, thanks for the correspondence. I’ve already left a response on the facebook group, but am copying it here since there tend to be different audiences. I’m not sure if everyone discussing the article has actually read the whole thing, but I hope you will do so. I know that people on this group feel misrepresented by my piece. In turn, I feel that my piece has been misrepresented. I am glad to take full responsibility for the words I wrote, but none of us should be judged by words we didn’t say. In general, I hope you’ll see the piece is not about this facebook group, or even about the infamous purple shed. It’s about high emotions. It touches on the frustrations of house-buyers and owners as well as renters. And it has a good variety of sources — see the links to the Portland Chronicle, a city report on housing fairness, research pieces on ADUs, Portland Monthly, and more. Certainly this facebook group got me thinking. I had a lot of fun reading it, which is why I called the group “often-hilarious,” which is the only description I applied to the group. Was it right to use the group as inspiration? I thought so. Until a day or two ago, it was a Public group, discussing issues important to society. It’s like a town square… public discussion is public. Was it right to use specific photos from the group? The weird thing about this question is that most photos in the group (and in my post) had already been appropriated from some other source. For example, the photo of the purple shed originated on Craigslist. 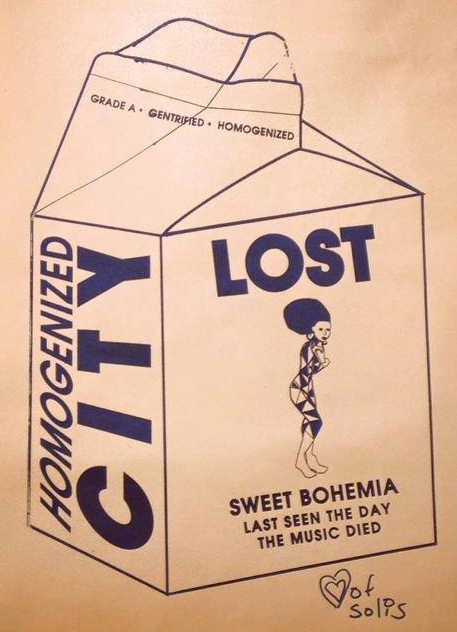 The San Francisco milkbox art was a photo of a flyer freely stuck up on a wall. The only thing I actually “appropriated” myself was Brent Ward’s ad, and that was so funny I just couldn’t resist. Thank you, Brent, for a laugh. Though there’s a “fair use” case for using it, if you would like I could take it down and just give a verbal summary of it. To finally get to the content of the piece, it arose not just from my reading of reddit, etc, but from my study of rents in ADUs and other properties. I’ve looked a lot at Portland rents for more academic work I’ve done, and what I discovered was that in Portland, people will pay $500-$600 for even the very worst apartment, whether it’s legal or not. They don’t seem to pay by the square foot, but rather by the unit. What people seem to want is not square footage, but places to call their own. Now it turns out we need a lot of those places. The piece basically says, development can be top-down (big government and business), or bottom-up (in this post, creative homeowners). Top-down is the dominant mode, and no one seems happy with the results. In terms of bottom-up, the shed offerings we’re seeing look bad, but they’ve got some (not all) of the elements of a form of housing that’s actually pretty good: the ADU. Modest, permitted ADUs — not shanties — are what the piece advocates for, if you read to the end. There are other forms of housing that could be bottom-up, too, like land trusts or co-ops, but I don’t know enough about them (yet) to write about them. So, I conclude, let’s not wait for government and big business to create housing that demonstrates the right values. Let’s make it ourselves. Let’s put our creative energy into that. I think Chloe made a good point when she said I shouldn’t assume that people making jokes about housing aren’t involved in more constructive activities. I shouldn’t have implied that. Equally, I feel a bit misportrayed to be called a tiny house evangelist — I do work on a web site about ADUs, but they’re not the same thing, and I certainly know their limitations. So, is my bottom-up development dream foolish? Perhaps. But to me that’s what the piece is about. Tiny houses are a crucial component of any sustainable solution. I see two kinds of tiny houses: 1) ones on wheels. By definition these aren’t connected to land. You can own them, but you need a place to put them, which is the “mobile home park” scenario… the tiny house owner still needs to pay rent. As some mobile home “owners” have experienced, this doesn’t give one real control, because the park landlord has so much influence. Moving a mobile home is a pain, especially when you’re old. 2) ones on foundations. These are connected to land, which means that (whether it’s a private plot, or an ADU scenario) the value of land strongly affects affordability. A “shack” could be valued at $500,000, if the plot is in the right place. In a densifying urban environment like Portland, I see tiny houses (on wheels or foundations) as a creative, flexible and hopefully inexpensive source of rental housing. As a community resource, having those things around is a medium term solution. They can provide housing, and moderate income for owners, until it becomes clear whether more permanent changes are necessary. But I don’t necessarily agree that tiny houses are a long-term solution from an individual’s perspective — this would be true only if they can own/control both the dwelling and the land for a predictable price. How is this possible? Co-op tiny home parks? Land trusts? I’m curious. I appreciate both Martin and Chloe’s spin on what has emerged as one our most pressing social issues: the lack of affordable and sustainable housing. I must confess, however, that I worry about ADU development in Portland as it is presented in Martin’s blog, “Do ADUs Provide Affordable Housing?” A quick trip through the Airbnb website for Portland shows us that many ADUs rent as temporary shelters (nightly rents of about $125) and are therefore not an affordable solution, in most cases, for Portland renters who live and work in the city. In considering the definition of affordability (according to the article) it seems the trend to build ADUs seems to favor homeowners, not renters. This would seem to indicate that ADUs will have little or no significant impact in housing the growing sector of displaced renters in Portland, sadly. I love the idea of promoting “citizens as developers” but this only works right now for folks who already own property or people (developers) who have access to capital. To consider the idea of citizens as developers, community land trusts and cooperatives need to be explored and promoted to help include citizens in the development process. Shared housing, with better access to conventional lending and using new models like limited equity, can help citizens collectively buy, develop and provide affordable housing in Portland. We can then “seize the means of housing production” and build or retrofit homes legally and affordably within the scale of residential neighborhoods. Thanks for your thoughtful comment, Amy. In reference to the number of ADU’s being used as short-term rentals, I think we need some better information. The only objective information we have right now for Portland is several years old — in 2013, a survey of ADU owners had about 5% being used as short-term housing and 80% being used for long-term housing. That doesn’t sound bad at all, but it may have changed by now. The question is, how much has it changed? Looking at airbnb won’t really tell you a percentage, because by definition it doesn’t show the things being used as long-term rentals. Also Airbnb has a ton of unpermitted stuff that would never count as a legal ADU. This is not to minimize the issue, but merely to say we really need to know more. I’m glad that you like the idea of citizens as developers. I don’t think that it can solve the entirety of the need for affordable housing, but it is unique in that citizen-developed projects are not tied so strictly to market prices. I love the idea of land trusts and so on, because in philosophy they are utterly different. I would like to be involved in one for that reason. They are disconnected from the market, and that is wonderful. But I am not sure they are the entire answer either. True co-ops, land trusts, etc. are sufficiently complex to set up that I feel they might limit housing in a different way…. not via finances, but via social status. Consider the project described in this NY Times piece on an artist’s cooperative in NYC… there is a profound selectivity for new residents, it’s just not financial. However, this doesn’t mean we should accept the displacement of low-income households while rents continue to run amuck in traditional rental markets; there is much we can do to advocate and promote alternative housing models. We need a collective collaboration between stakeholders, financial institutions, developers and the government to make that happen. A mixed portfolio of sustainable housing alternatives, including cooperatives, would serve the city well (no McMansions, please!) I would love to discuss ideas on how to make that happen! About selectivity in renting: there isn’t much anyone can do, in any form of housing, outside of the Fair Housing Act, to control access. I’m sure if you were renting a room in your house, or an ADU in your backyard, you would be just as selective as the artist’s cooperative you referenced. Perhaps more transparency and broader outreach, using a lottery system, might help the selection process be more equitable. This entry was posted on May 27, 2015 by Martin John Brown in News, Policy & Trends and tagged featurepost.